Like most older children and teenagers my 9 year old wants a tablet for Christmas so I have been weighing up a few options for the best one. I recently came across this one retailing at £90 in Fashion world . The tablet has a very sleek looking design and boasts a 7 inch screen which I think is an ideal size for a child. It’s screen is a multi capacitive touch screen and it responds remarkably well to touch without being too sensitive and erratic. I was able to easily access all the features with a light touch. If comes with built in wifi which again is very good as it instantly picked up my wifi signal from upstairs without problem. The tablet is android and therefore gives full access to the google store where games and apps can be found and easily downloaded. It’s best to find some sort of parental software before giving this as a gift to a child so you can feel a little easier whilst they are on the internet. There is a camera built in which isn’t the best at 0.3 mega pixels but still takes a fairly good photograph for a child. The memory is 512mb with 4 GB flash memory. There is a handy memory card slot for memory expansion should you need more. The device takes up to a 32 GB micro Sd card. Also a high speed USB port is also there to connect other devices. The tablet is better than what I imagined for such low cost. It’s so easy to power on and off and the android system makes it so easy to use and navigate everything. 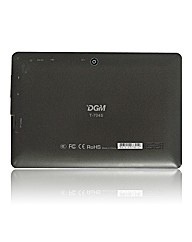 I would highly recommend this tablet for anyone wanting a gift for a teenager or even a low cost tablet for themselves.